Golden light filters through stained glass. The result is dust-mote-sprinkled rays of brilliance: indigo, magenta, violet. In late afternoon, Founders Chapel has a certain reverent hush about it, at least until members of the choir trickle in, greeting one another with hugs and laughter. Before launching into song, there are rituals to be followed, many instituted over the years by Welsh, who has literally been a part of the choir since day one. There are vocal warm-ups (“mah-meh-mee-moh-moo” in ascending tones); the organic formation of singers and musicians into a tidy circle on the altar; the rushed scurry of the occasional latecomer welcomed with wordless waves; and familiar songs sung in rounds (“Swing Low, Sweet Chariot”/”When the Saints Go Marching In”). After a bit — perhaps five minutes, maybe longer — hands are clasped, heads are bowed, a heartfelt prayer, a shared moment of tranquility, and then, it’s time to begin. The lucky few who make up this melded choir can’t help but be uplifted by the experience. “’Canticle of the Turning’ is one of my favorites,” says Peter Bennett ’97. While it’s not unusual for the USD theology professor to be on campus, singing with the choir again is clearly special to him. The song — and the choir itself — has lasting resonance for Rohanee Zapanta ’98, ’01 (JD) as well. really belonged at USD when she moved onto campus as a first-year scholarship student. “I wanted to leave,” she says. A priest noticed that she was struggling and asked her what she had enjoyed doing back in her neighborhood. When she answered, “I used to sing in the choir,” he knew just where to send her. There’s a similar heartfelt reaction from Jeanne (Pierik) Goodyear ’79, who says that being back with the choir feels like coming home. Tracy (Zetts) Telliard ’12, ’16 (MEd) echoes that sentiment. 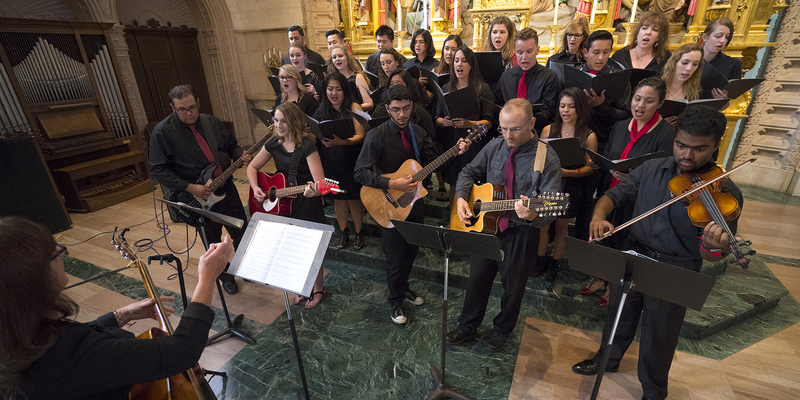 She says that the choir was a huge part of her undergraduate experience; in fact, she’s since organized the Founders Chapel Choir Alumni Affinity Group and leads her own church choir of high school students in Del Mar, California.